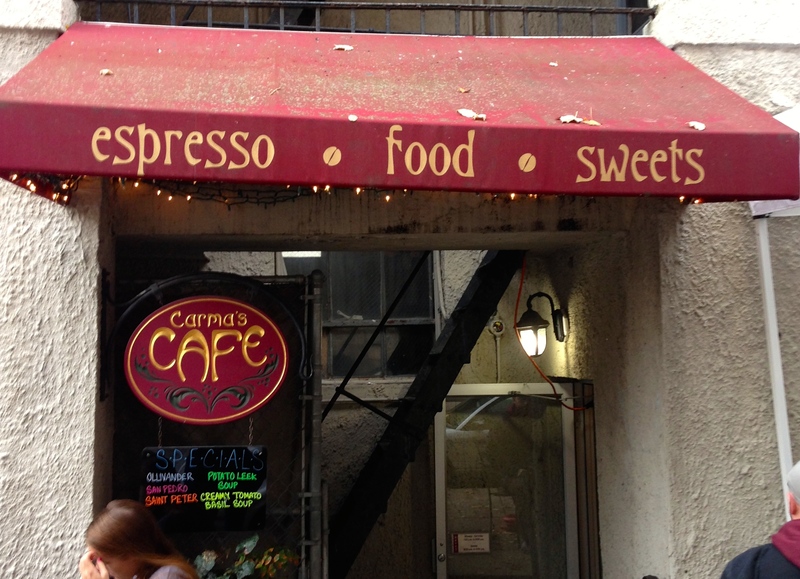 Carma’s Cafe – eating my way through Charm City! I went for the chicken salad sammich with the sesame noodle salad. The baguette had a fresh crunch and was filled full with a hearty chicken salad with grapes, celery and some baby greens. I loved the grapes in the chicken salad – adding great texture and brightness. This was so much food, especially when paired with their noodle salad. I usually go the side salad when I eat in because I like their tangy house dressing – but the sesame noodle salad travels a little better. I am not a huge fan of sesame noodles in general; It is not normal go to. But, it sure is at Carma’s. The cold noodles are lightly dressed with your classic sesame sauce. This one is lighter on the peanut flavor – which highlights the sesame, chili and green onions. These guys are great and don’t get nearly enough attention with some of the bigger chains nearby. The cafe inside is on the smaller side, so it fills up quickly, but they have tons of outdoor seating for when the weather is nice. Remind me to go here next time when I am in a rush – they hade twice the number of folks in line and I was in and out in less than half the time of some other cafes. This entry was posted in Charles Village, Charm City, Lunch, North Baltimore, Yay! I'm a Fan!. Bookmark the permalink.